The Be Our Guest Podcast annual fundraiser for Give Kids The World will take place on June 11, 2014 beginning at 11:00am Eastern time and will continue for 12 hours! You will be able to listen to this event on Magical Mouse Radio found on Live 365, and there is usually an overflow site available. The goal for this year is $10,000! I hope you will all consider how you might help and reach deep into your pockets to help Give Kids The World serve more families! I love GKTW and have chosen to get the word out when ever and where ever I can! 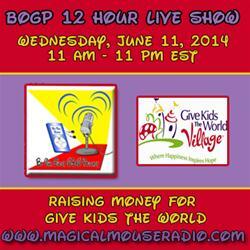 Visit http://www.firstgiving.com/fundraiser/beourguestpodcast/twelvehourliveshow2014 for more information and giving!